Chillsner, one way to keep you beer cold this summer! Now that we have officially passed the first day of summer, we know that the really hot days are still ahead of us. With that in mind, we figured a rundown of ways to keep your beer cool was in order. There’s nothing like getting to the bottom of your favorite beer only to realize that it is uncomfortably warm. How do you keep beer at a good drinking temperature during the summer? As with other things in the brewing industry, there are many opinions on this subject. We are going to skip past the whole style vs. temperature discussion and make the assumption that since we are talking about the summer heat that means we are talking about Lagers, Pilsners and other summer centric styles. That being said, many people still find a really cold beer more refreshing than a slightly warmer one. So, what can you do besides freezing the glass? When you get right down to it, you should drink your beer at whatever temp you prefer. Life’s too short to get your undies in a bunch. Relax… have a beer! This Friday, June 24th, we welcome R Taco back for their first visit of the summer. A fistful of tacos in one hand and a pint of Lime Shandy in the other sounds like a great start to the weekend! On Saturday, June 25th, Soup Coupe will be here with their summer selection of selection of both hot and cold soups as well as a tantalizing variety of lettuce wraps. I can personally attest that the gazpacho pairs perfectly with an IPA…. just sayin! Also on Friday (the 24th), we’ll once again be tapping a batch of Raspberry Infused Pyro, because you all still keep asking for it. Not that I blame you, it is a bit of a hot weather quencher. On Friday, June 24th, we are excited to once again be part of the Beer Dabbler at Twin Cities Pride! The 50+ participating Minnesota breweries will each be serving a special, one-off beer that celebrates and pays homage to the icons and advocates from the GLBT community. For our contribution, we will be unveiling our “Rad Bromance”, a Raspberry Chocolate Strong Ale in tribute to Lady Gaga. We hope to see you there! Newsletter: Dad is the best, don’t you owe him a beer (or two)? Do you have any recommendations on gifts for beer lovers? Since there are beer lovers who are very serious about their chosen passion and those that are more in it for the fun and flavor, we thought we could highlight some gifts for both. Almost all taprooms have Growler Gift Packs. These generally contain a growler of beer (your choice of style) and one or two pint glasses. If you are undecided as to which beer dad may like best, most breweries have gift cards as well. If a gift card or a growler gift pack isn’t quite enough, or your dad is a guy who enjoys wearing his love of beer, baseball hats and T-shirts are also available at most taprooms. If you are internet savvy, you can also find beer themed socks, ties, phone cases, briefcases, holsters, soaps, and all sorts of other crazy… stuff. Many cities have taproom adventures – things like passports or guidebooks that allow you to gift your dad with a fun activity. Here in Minnesota we have two that we are participating in: Barventure and the Northern Ale Guide. There are also beer events going on throughout the summer, that you can buy tickets to. Beer festivals and beer pairing dinners are just a few of the neat activities going on this summer. You can even find unique beer activities like the Beer and Bacon cruises that are being run here on the Mississippi. Burning Brothers is the featured beer for cruises on both July 30th and September 10th. This Friday, June 17th, we have a brand new food truck, Wholesoul, joining us featuring wholesome soul food. On Saturday, June 18th, Crazy Puppy will be here with a new menu item, fried green beans, to compliment the usual fair food menu. This Saturday we have two different beer events running, on opposite sides of the Twin Cities. To the Northwest we will be at the Maple Lake Brewfest, and to the Northeast we will be at the Hay Lake Beer Tasting. 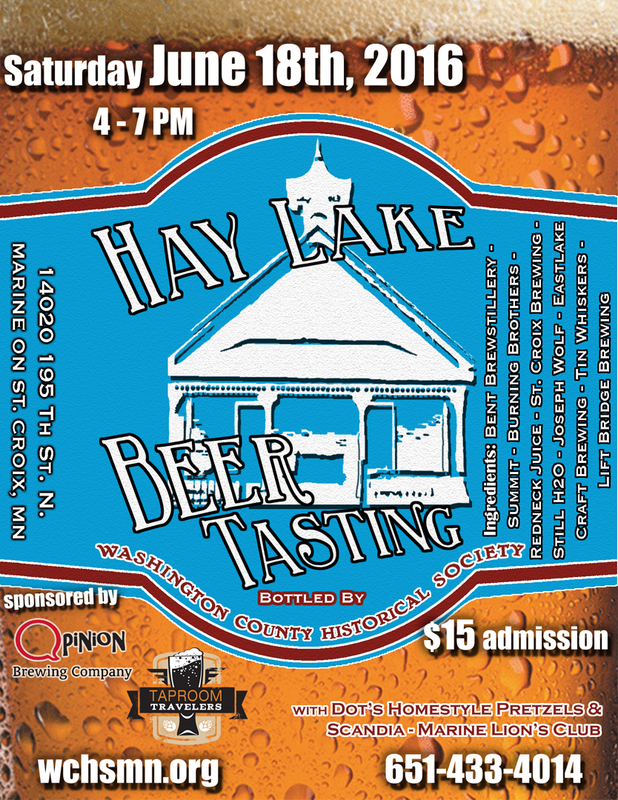 Both of these events look to be a lot of fun, with the Maple Lake Brewfest featuring over 50 breweries, and the Hay Lake Beer Tasting supporting the Washington County Historical Society. We hope to see you at one or the other of them! Piped fermentation tanks on the left, waiting to be piped on the right! This Saturday, June 11th, is Carl Von Linde day, our June beer holiday (unless of course, you count Father’s Day). Carl Von Linde is the “father” of the modern lagering process, allowing lagers to be produced year round, rather than having seasonal dependency. It was in 1871 that Carl created the first large scale refrigerated lagering tanks. These tanks allowed the beer to be fermented at the relatively cool temperatures necessary to create a good lager, and ushered in a new era of temperature controlled fermentation. Are all those pipes connected to the tanks used for moving the beer around? Actually, all of those pipes help to control the temperature of the tanks. When we move beer around, we use big hoses. The pipes that you see, wrapped in the black insulation foam, actually carry glycol from tank to tank, maintaining each tank at a specific temperature. There is a thermostat on each tank, that allows the brewers to set that particular tank’s temperature, depending on where the beer is at in the brewing process. When beer first moves from the kettle to the fermenter, it needs to be maintained at a specific temperature for the yeast to get busy, which is what allows fermentation to happy. Ales are usually around 65 degrees, while lagers are kept in the 50’s, a relatively cold temperature compared to other beers. Once the beer has finished fermentation, it is “cold crashed”. This involves dropping the temperature on the tank to between 33 and 40 degrees, with 38 being the most common. Cold crashing encourages the yeast and any other solids to drop to the bottom of the fermentation vessel, where it can be dumped out as waste (“trub”). Dumping the trub helps to prevent it from imparting any off flavors to the beer and also makes the filtering process much faster and more efficient. Tap selection for this weekend includes the usual suspects along with the remainder of our Raspberry Infused Pyro. This Friday, June 10th, we have Signature on Wheels joining us, with their delicious take on classic American cuisine. On Saturday, June 11th, Soup Coupe will be here, with soups for hot weather! Ever tried gazpacho before? Now’s your chance! On Saturday, June 11th, we will be in Milwaukee serving up refreshment at Beer Camp Across America. Join us as we celebrate the craft beer movement with 99 other breweries, and hundreds of beers to try. Running from 3 to 7PM, with music by Maritime and local food trucks, it is sure to be a good time! Where we store our brewers, when they aren’t working! So, who makes all your beer? It would be fair to say that a huge portion of our beer is made by Andrew. Without his attention to detail, focus on quality and skill with a squeegee, we would be up the proverbial creek without a paddle. While Andrew does not spend a whole lot of time in the taproom, he is a regular at beer festivals. It only seems fair to give people a little insight into what he does, hence, the quick interview, which he managed to do while working the canning line – way to multi-task, Andrew! About 80% of all the physical activity that happens on the brew floor, I’m involved in. Brewing, cleaning, canning, cleaning, kegging, cleaning, filtering, oh, and cleaning, in case I forgot to mention that. I’m also the DJ, all those dance parties, those are me! (A quick note from the interviewer – there is always music going on the brew floor, and it is eclectic! Anything from movie soundtracks (Jurassic Park?) to musicals (Les Miserables is a fav), bluegrass, industrial, classic rock or alternative). As much as I enjoy shoveling rock while landscaping (his last job), brewing beer is a lot more satisfying. Being at the beginning of a new business, there from the start, is also a pretty unique thrill. Also, having a career for the first time in my life, rather than just a job, is really great. Having a beer at 11AM on a hot day doesn’t stink, either! I never thought I would be moving water from one place to another as much as I do when I started here. Brewing is a wet business, so I spend a lot of time with the squeegee, whom I have a love-hate relationship with. Oh, they’re all good (Andrew said this with a grin and a glance at Thom, one of the owners who he was working the canning line with). After a moment of serious thought, though, he replied with “The Belgian Dubbel was really fantastic, we will have to brew that again soon”. I really enjoy brown ales. You don’t see them all that often, however, you can enjoy them any time of year. If I could get my hands on a Pliny the Elder, I would drink that! (Editor’s note: this is more of an inside joke) However, if I am by a lake, I’ll pick up a six pack of a Miller High Life – I’ve grown to appreciate the fact that it’s just not that easy to brew a good lager. Neo, because he’s the one (harking back to his love for the Matrix). If I could brew a series of cinema themed beers, I would do it! The first thing that comes to mind is a grated floor (see squeegee above)! A patio would be cool for the taproom. A centrifuge wouldn’t be too bad, either. Oh, and a pool table, it would be for our regulars, not just employee use! Beer for this weekend includes the usual suspects along with another round of our Raspberry Infused Pyro, tapped on Friday, June 3rd (you all keep asking, so we keep making). Also, on Friday the 3rd we will be joined for the first time by Xstream Cuisine, bringing us their American and Caribbean deliciousness. On Saturday, June 4th, we will have Patacones back for their second visit, serving their authentic Colombian street food. This Saturday, June 4th marks the 8th annual St. Paul Summer Beer Fest, taking place from 2-5pm (VIP at 1pm) at the MN State Fairgrounds – International Bazaar. This outdoor craft beer festival will feature sampling from over 100 breweries in a commemorative tasting glass, live music, tasty food, educational seminars, a silent auction benefiting the YMCA of St. Paul, and the fun atmosphere of MN State Fairgrounds. We hope you will join us there! In other news, we thought we would share the fact that we are one of the 18 recommended projects for this year’s Neighborhood STAR program. This means that if we get approval from both the City Council and the Mayor, we will have funding for the patio we are hoping to build. We find out what the final word is sometime in July.